Protoypical signal systems present "Aspects" to the engineer to tell him how to run his train. The "Stop" aspect, for example, is pretty simple: "Stop the train". The "Approach medium" aspect indicates something more complicated: "Proceed approaching next signal at medium speed". Each aspect has an associated "indication", which is usually codified in a railroad's Rule Book. The picture to the right shows an example, Rule 282 from the 1946 AAR rule book (Aspect: Approach Medium). A collection of plain instructions let you set up Signaling in 7 Quick Steps. Signal Mast objects represent an entire signal with one or more Signal Heads. A Signal Mast can operate all its Heads, as required to do full prototypical signaling based on aspects. When its Aspect is set to e.g. "Approach medium", JMRI handles the layout communication needed to make the signal on the layout display the right colors. Signal Masts are configured through the Signal Mast Table. You add new ones with the "Add..." button below the table, which takes you to the "Add Signal Mast" window. There you specify what kind of signaling system is to be used (see the list below), the specific signal type eg. 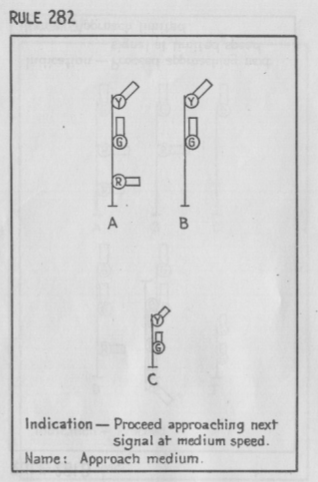 "double searchlight" or "double head dwarf" and which Signal Heads this Mast is going to drive. You can add a Signal Mast icon in the Panel Editor by right clicking at any location and choosing "Add item > Signal Mast". In Layout Editor enter the Signal Mast address and shift click on a turnout or anchor point on the panel where you want to place a Signal. The Signal Mast icon will display the images specified in the appearance definition for that particular Signal Mast type and system. The Signal icons displayed on your panel are part of a Signal System and they can't be changed individually by the user like Turnout icons. 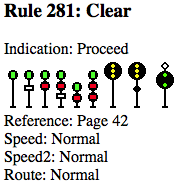 Image on the right: Rule 281 Signal Icons from the AAR-2 Signal System. Signal Groups are used to define a number of Signal Heads, where only one Signal Head can be illuminated at any given time, depending upon the state of the associated Signal Mast and a set of conditions. Signal Groups would be used where additional indicators are used to support the main Signal Mast, such as Junction, Route or Speed displays. These indicators provide additional information to the driver (US: Engineer) that is not given by the main Signal Mast. Such indicators are frequently seen in European and UK signaling. The Signal Mast Logic tool allows the Signaling Logic to be built up as pairs of conditionals between Signal Masts on the layout. The Signal Mast Logic will use the states of Blocks, Turnouts, Sensors and adjacent Signal Masts to determine what Aspect a Signal Mast should be displaying. If the layout has been drawn up using the Layout Editor and Signal Masts have been placed on the panel using the various tools, then it is possible for all the Signal Mast Logic to be dynamically built, with little user intervention. For panels created with Control Panel Editor some of this information has to be entered manually. Signal Head objects in JMRI are not aware of their position on a mast and the Signaling System they are part of, so as individual objects they can't show Signal Aspects. Individually they can only be set to specific Appearances (colors), either from the Signal Head Table or via Logix. In short, a set of files for the selected Signaling System contains the basic code to determine which combinations are available in the Signal Mast Logic tool. In the xml/signals directory located in the JMRI program directory, there is a directory for every Signaling System that has been defined, with one "aspects.xml" file which lists all of the possible Aspects plus a number of "appearance..." files (i.e. appearance-one-searchlight.xml), each of which describes the possible Aspects based on one Signal Mast type. These essentially say "if the next signal has an 'x' aspect, then the current one needs to show a 'y' aspect" (more details). The Signal Mast Logic table is then used to check which Signal Mast pairs are active in the Signal Mast Logic and whether the Aspect should not be 'Stop'. This is done by looking at Turnout positions (if applicable), Block occupancy and - possibly - Sensors. On the Signal Masts tab you might even specify additional Signal Masts to watch, e.g. for an Interlocking. For any Signal Mast, there can be 1 to n destination Signal Masts, one of which is active based on the positions of Turnouts connecting the protected Blocks. If everything is OK, then the appropriate "appearance..." file for this Signal Mast type will be used by the Signal Mast Logic to assign a new Aspect based on the Aspect of the next Signal Mast. Signal 4B showing the "Stop" Aspect when sensor OD1 is Active (at left) and "Approach Diverging" when the block is empty (at right). A non-prototypical set of aspects and appearances that most model railroaders will understand easily. From the New York Central System publication "Rules of the Operating Department, Effective October 28, 1956." The most current list of Aspect Signal Systems supported in JMRI can be found at http://jmri.org/xml/signals/. To create your own Signaling System Definition follow these Instructions. If you do create a new definition for another prototype railroad or era, after testing please contribute it back to the JMRI project so we can distribute it with future releases of the project for others to use. Like Decoder Definitions in DecoderPro, the more Signal System Definitions we have, the more useful the program becomes, and the more people spend time to improve it. We all win that way! Signal Masts can be both tested (in Conditionals) and set (in Actions) via Logix. When you're editing a Logix Conditional or Action, you have to type the Signal Mast name and hit enter/return so that the program can look up the available Aspects for that particular Signal Mast. where the first argument is the aspect name (use, for example, m.getAspect() to obtain the current one on the mast) and the second is a specific property. Properties can be defined programmatically via e.g. m.setProperty("Clear","speed","69"); or get loaded automatically from elements in the aspect.xml file that defines the specific signal system. In addition to the global properties for an Aspect, there can also be local properties to a specific Signal Mast type. An example of this is the default icon image: The image for a two-head Signal Mast is different from that for a one-head Signal Mast, even if they both represent "Clear". In words, this is saying "Get the Appeance info for this Signal Mast, and then check the imagelink property of the Clear aspect".